Induction 2x Dell'Orto PHM 36 mm carburetors. The late 70s the Italians were losing their grip on the big-boy market since their macho V-twins just couldn't out-perform the life-threatening monsters from Japan. Instead Ducati's fabled in Fabio Taglioni set about designing a mid-weight of distinction. He succeeded. The 90° V-twin Pantah went as well as it looked, and was quiet and gutsy to boot thanks to Desmo valve gear, toothed belts for the cams and a 60° valve angle - the last a common racing mod. Handling was excellent thanks to a light trellis frame although the suspension was perhaps lagging a little behind this creation. The styling was different, if not to everybody's taste, especially as it looked as if the fairing had come off something bigger. At least it looked a lot more beautiful than the later 600TL. With a top speed of 117mph it was no slouch, but mods, and the later 600 version, could put this up by 10 mph. 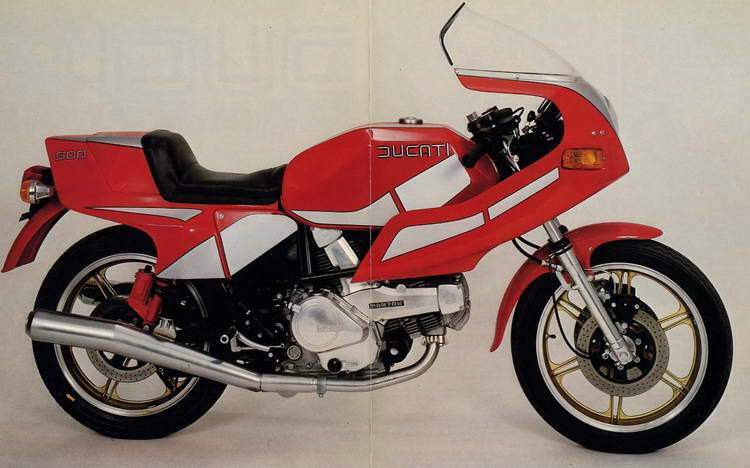 More than a decade later, Ducati are still using many of the ideas first realized in the 500 Pantah. 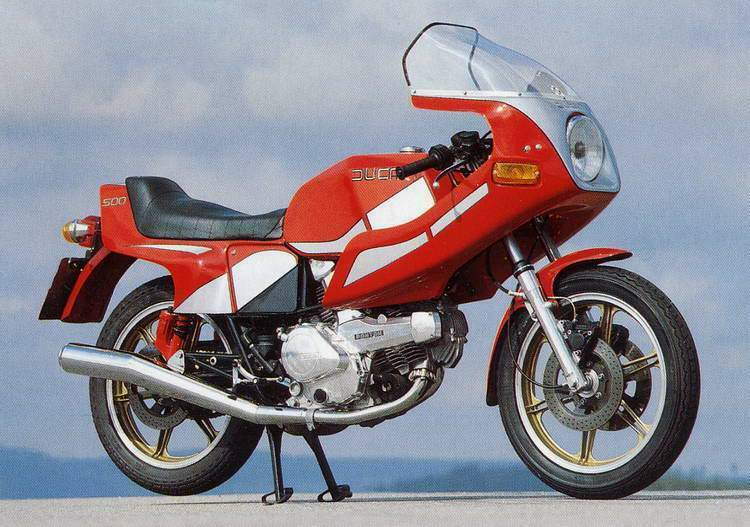 The first 500 Ducati Pantah appeared at the Milan show in 1977, but didn't make it to England until late 1980. The engine remained almost the same throughout its production run. It featured an over-square 78 x 58mm bore and stroke with vertically split crankcases. Plain big end bearings with separate conrods caps and shells were used instead of the usual caged roller bearings. Like other Dukes it was a SOHC 90° V-twin with desmodromic valve gear but unusually, it featured belt-driven cams. Originally the bikes were fitted with Marzocchi forks, but some had Paioli units. Rear shocks were bright red Marzocchi with gas assistance. Series-one to series-two kind of evolved rather than was launched. The series-two got a new two-piece fairing and new gearbox. Other models were a police version, an economy model without fairing, and a touring bike with panniers and one-piece bars. The 600cc Pantah appeared in 1981, courtesy of an 80mm bore, but it also featured a hydraulic clutch and larger front brake calipers. 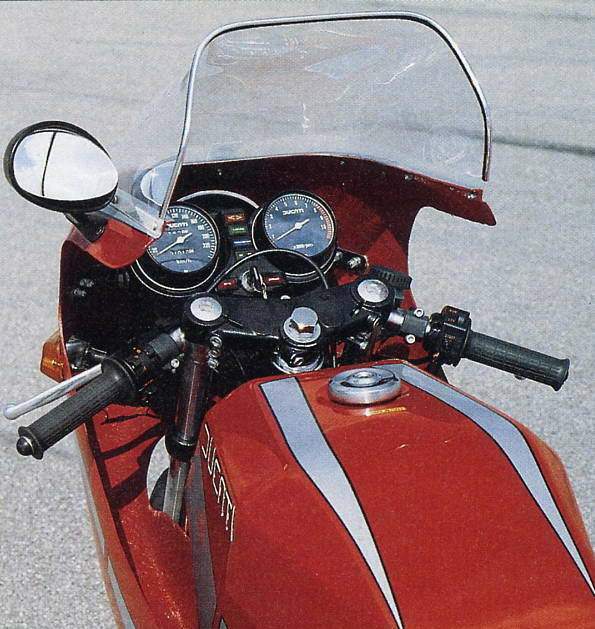 The 600TL came out the following year, with bikini fairing and vented side panels. The original Pantah finally went out of production in mid 1983. The all-new Pantah engine proved to be a success, and seems to have managed to avoid some of the common Italian pitfalls. The Desmo valve gear looked pretty frightening but was reasonably straight forward to adjust so long as you measured the shim gaps before removing the rocker spindles and arms. Very early models had six dogs per gear in the gearbox and these tended to jump out of mesh quite often. Later gearboxes, with three per gear, were much better, and should be fitted to any bike you find now bar very low mileage examples. The toothed cam belts should last around 15,000 miles and are cheap and easy to replace. The oil filter is a car-type spin-off, so general servicing is idiot-proof. Handling is obviously a strong point but the forks can get a bit hot and bothered under sustained use, so a change to heavier grade oil should help to cure a tendency to dive to the tarmac after a long run. This often only comes up under racing conditions, a use which also showed that the gearbox could get a little slow when under the gun, and clutchless gearchanges were not an inspired idea. Since there is only electric start, it is a good idea to keep an eye on the electrics, but remember that the battery has the tiresome habit of discharging itself when left for any time. If you know you wilt be leaving the bike standing for any length of time it is best to disconnect the battery.